Saudi Arabia was established in 1932 by King Abdulaziz Al Saud (1876-1953) – usually referred to as Ibn Saud – after thirty years of war to unify large parts of the Arabian Peninsula. It is an absolute monarchy. 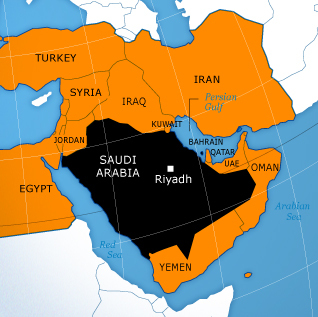 Saudi Arabia is a vast, expansive country, spanning about 1,500 kilometres in length and another 1,500 kilometres in breadth, thus making up for 80 percent of the Arabian Peninsula. A substantial part of the southern region consists of desert tracts, where rain seldom falls and the climate can reach extreme temperatures during the day. As a result, human existence is barely feasible in most areas of the country; instead the reasonably sized population live predominantly along the Red Sea and Persian Gulf coast, and around other large oases elsewhere. More so than its vast area, Saudi Arabia’s enormous reserves of oil and gas, which were discovered in 1938, have enabled it to play an increasingly important role in both regional and global politics.